This is such a soft, rich green. I found a good number of Hydnellum aurantiacum in the fall, enough for quite a large dyepot. 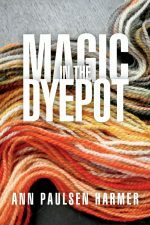 I put a succession of rovings through three exhausts, then spun them into textured yarns, using the various shades of the same colour. I’d read that shifting the pH to the alkaline side on this one can sometimes result in a blue, but I had no such luck. In fact, even at pH 11, I noticed little difference in the colours. I have plans for this skein, involving a secret gift exchange among members of my spinners’ and weavers’ guild, but that’s all I’m going to say for now. In the world of natural dyeing, pale yellow is almost something to yawn at – it’s so easy to get with any number of grasses, leaves and weeds. 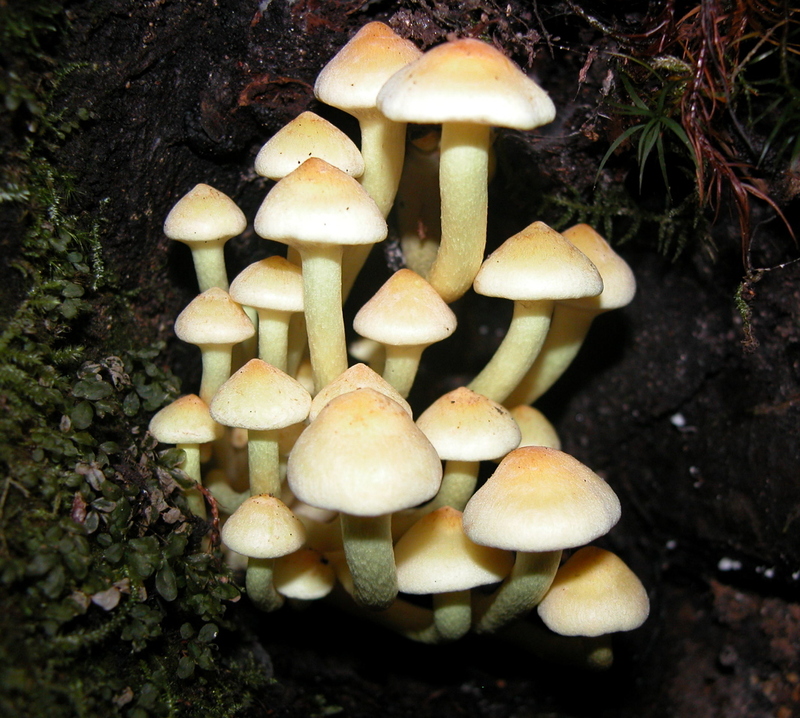 However, the sulfur tuft (Hypholoma fasciculare, formerly Naematoloma fasciculare) is one of the first dye mushrooms to appear in the fall, usually in early September, so I love to get a dyepot of its good, fresh colour going as a start to the dyeing season. I’ve tried letting the mushrooms dry and also leaving a fresh dyepot to sit for a week or two, and in both cases, the colour became more drab and less exciting. Another reason I love this little mushroom is because it’s the one Miriam Rice threw into a dyepot some forty years ago, merely out of curiosity if it would give any colour (she’d been experimenting with other natural dyes, but never with mushrooms). Fortunately for us, she’d picked a cluster of sulfur tufts, one of the few mushrooms that does give a good colour. 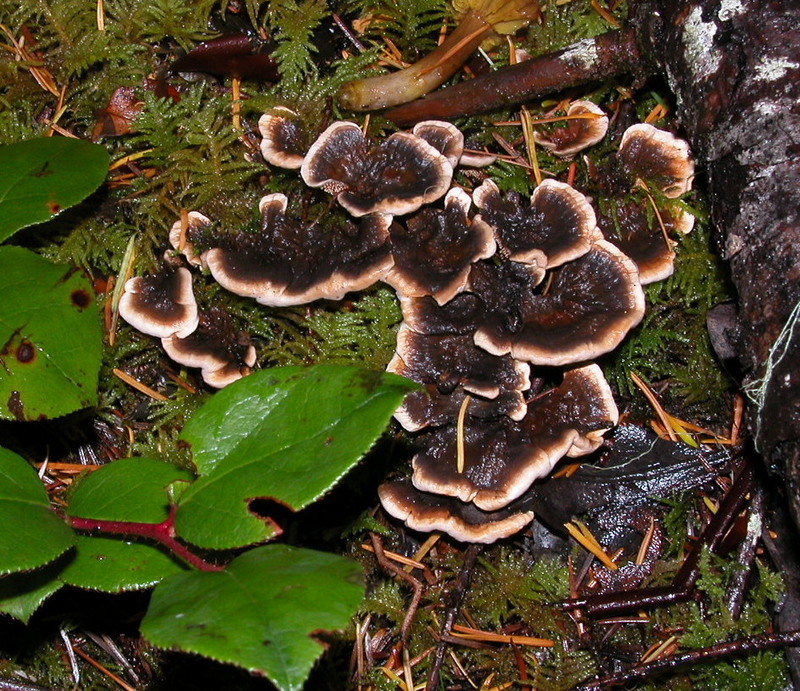 Had it been one of the many fungi that give a nice mushroom brown, I, and many others, probably wouldn’t be dyeing with mushrooms today! 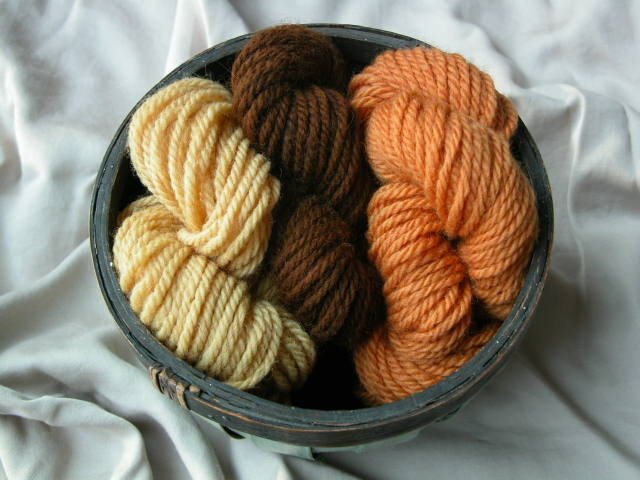 This is some sulfur tuft roving I dyed last fall, and this ply will be the wrapping for a spiral or boucle yarn. These colours came from varieties of Cortinarius semisanguineus, mushrooms that look like LBMs (little brown mushrooms) from above, but whose brilliant red, orange and gold gills attest to the pigments they contain. After saving two years’ worth of dye experiments, it was time to spin them up. 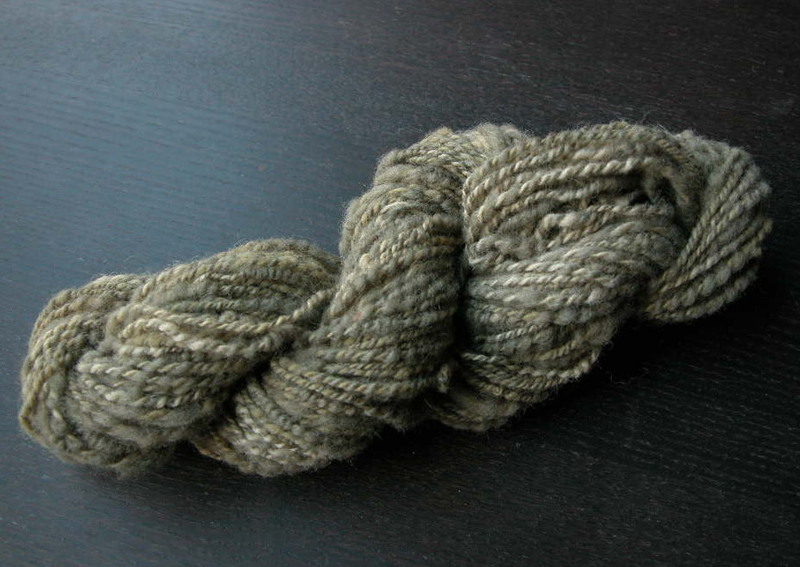 I’d used two kinds of wool – Merino and Corriedale – and separated them out, easily done by feel. 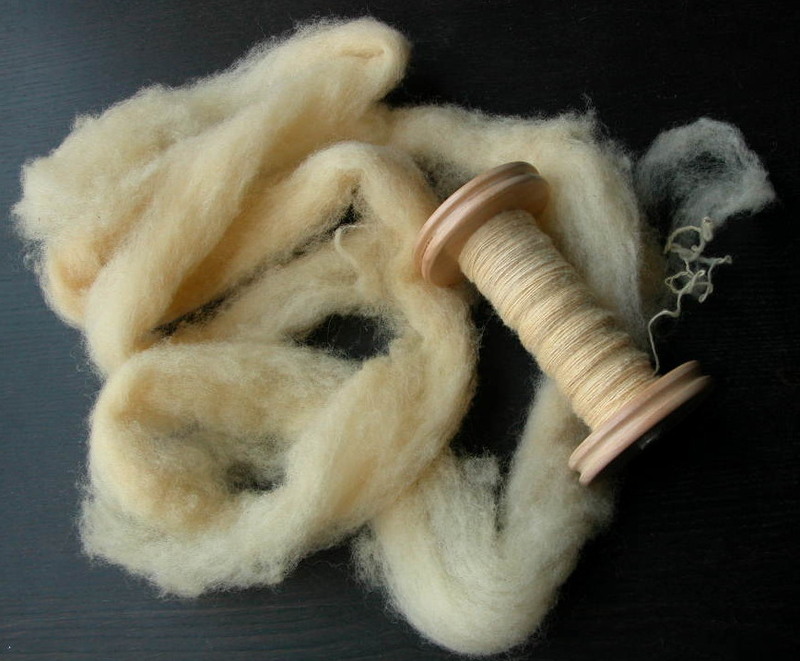 I spun the Merino first, shown here on the bobbin, then spun the Corriedale on another bobbin. 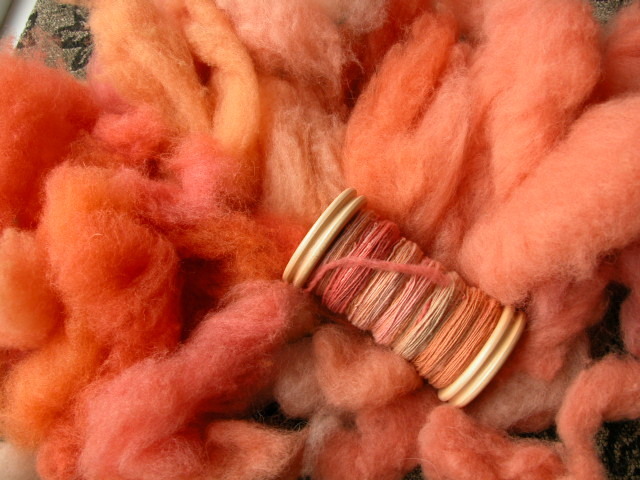 Colours always look brighter in unspun fibre; spinning and plying soften them somewhat. I plied the two bobbins together into a textured yarn, enough for two skeins. 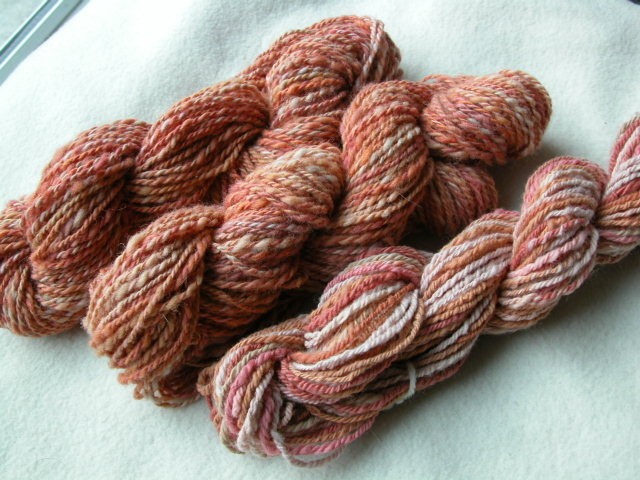 With some Merino left on the bobbin, I Navajo-plied it to get a three-ply yarn with distinct colour breaks. 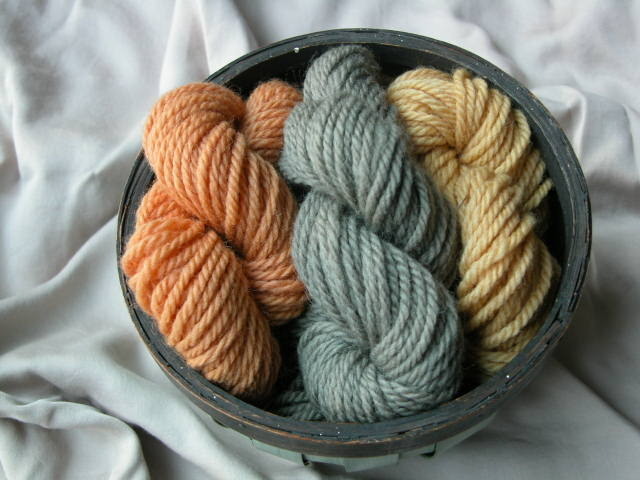 The last of this year’s dermocybes are simmering now in my slow cooker, and I’m dyeing silk with them. I’m saving the Cortinarius sanguineus to the end, as the colour is sure to be spectacular, although on the silk it won’t be as brilliant as if I were dyeing wool. Each of these trios gives yet another colour sense–I wish I had enough of the yarns to make three different garments, using each combination. 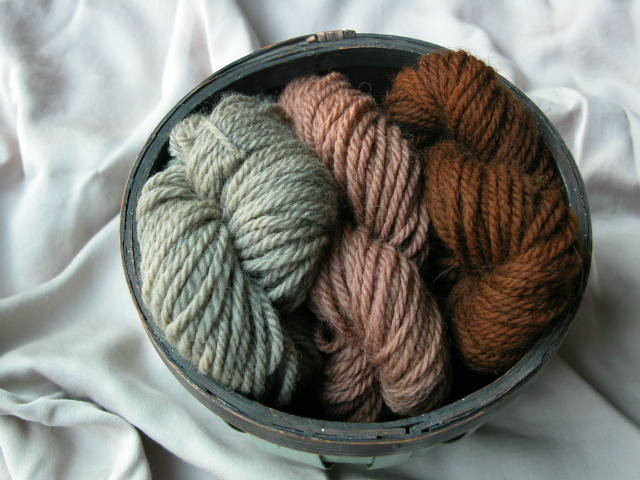 But now I’m devoting my fibre time to spinning the rovings that came out of my mushroom dyepots; photos to follow.